As a horse aficionado you know how important high quality protein is to the look and health of the animal. Yet you also probably know that while there are a number of protein sources available, not all of them are of the highest quality. forage to properly arrive at the amount of protein your animal is eating on a daily basis. For example, if you own a three year old thoroughbred gelding who weighs in roughly at 1,200 pounds and is not overly exercised or a performance horse, you will probably want to feed him about two pounds of protein per day. To meet this requirement you would be able to either feed the animal a protein mix that may be as low as 10 percent or as high as 14 percent. While this seems incongruous at first, you must understand that the average amounts fed are about 16 pounds of grassy hay which has about seven percent of protein and also about nine pounds of your commercially available grain mix, which will equal about 25 pounds of daily feed. As the hay will offer the animal about one pound of protein (16 x 7%), the grain feed must be formulated to supply the missing pound. To accomplish this, you will need to find a mix that contains at least 12 percent protein. 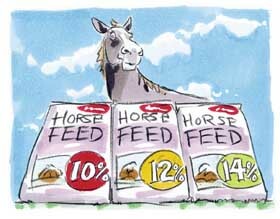 Thus, if your grain mix protein level is at 14 percent, your horse will do well, whereas a number less than 12 is suspect. Or course, if you put your horse in a professional stable, you might wonder about the 14 pounds of mixed hay containing 13 percent protein the trainer there might be feeding to your animal in addition to the seven pounds of grain mix that contain about 10 percent protein. Suddenly your animal will only eat about 21 pounds of feed, and you wonder if its needs are being met. Yet considering that the protein your horse derives from the hay is about 1.8 pounds (14x13%) and the protein received from the grain weighs in at about .7 pounds, you realize that your animal will ingest about 2.5 pounds of protein, still receiving enough protein for the day to day basis. As you can see, it is easy to get lost in the labels and arguments surrounding protein percentages. The truth of the matter is that every feeding protocol may be different simply by virtue of the different components being offered to the animal on a daily basis. Additionally, these calculations need to alert you to the vital importance that quality brings to your animal feed. The source of your hay is just as important as the protein content of the grain mix. If you are concerned about your horse’s nutritional intake, and if you are wondering if you are feeding enough protein by weight, take a good look at your animal. Is its coat rough and shedding does not happen with the seasons but seems to be an ongoing problem, you might find that the horse is not ingesting enough protein. The same is true if your animal looks too skinny for its breed, and your ferrier tells you that the hooves are a problem. On the other hand, if the animal is known to urinate more often than other horses, and additionally there seems to be a strong ammonia odor about it, then you might actually be overfeeding protein to the animal. Read the next horse nutrition article on Roughage: Grass and Hay in Diets.